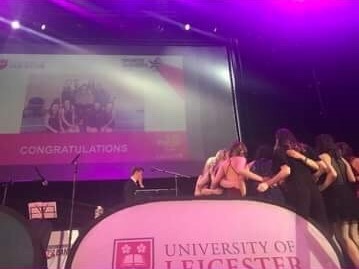 Wednesday saw one of the biggest nights of the year for sports people at the University of Leicester…Sports Awards! This is held at the Athena and consists of a three course meal, award ceremony and celebration followed by everyone going to Letsdisko. It is a great way to recognise all the sporting achievements of the year and to have fun with your teammates and other sports teams (it’s also nice to get dressed up for a change and see everyone looking smart – and not in fancy dress!). It was an amazing year for netball as we won Club of the Year, Committee of the Year and Sports Personality of the Year! My team also got to go on stage to get medals for being runners up in the cup. Other awards included Team of the Year which was won by Men’s Tennis and Most Improved Club of the Year. I had such a fun night and it was the perfect way to end what has been a great year!